New Delhi: Vodafone India Ltd, the nation’s No. 2 telco, said it will offer fourth generation (4G) mobile phone services, spending as much as ₹ 19,600 crore to buy spectrum in the auction that ended on Thursday, even as bigger rival Bharti Airtel Ltd announced its intention to provide similar services across India, potentially intensifying the battle for marketshare for billionaire Mukesh Ambani’s new telecom venture that is set to launch 4G services after winning spectrum in a 2010 auction. Vodafone India and Bharti Airtel spent a combined ₹ 38,130 crore, or almost two-third of the ₹ 61,162 crore that the government stands to make from the 2G spectrum auction after 10 days of bidding, as they readied to take on new entrant Reliance Jio Infocomm Ltd, a unit of Reliance Industries Ltd.
Reliance Jio, which also participated in the recent auction, won spectrum in the 1,800MHz band in 14 circles; it plans to use the airwaves to supplement the high-speed data services that it already plans to introduce using the broadband wireless spectrum it won in an auction more than three years ago for about ₹ 12,800 crore. Increased competition in 4G services may lower tariffs for 4G services and delay the break-even for Reliance Jio, which analysts and government officials said bid for spectrum in the 900MHz band and raised costs for existing operators such as Bharti Airtel and Vodafone even though Reliance Jio doesn’t have any known plans to offer services in this band. The fact that Vodafone is looking to roll out 4G services on 1,800MHz means it is planning to use the more popular FD-LTE (frequency division-long term evolution) standard as opposed to Reliance Jio and Bharti Airtel that are rolling out services on TD-LTE (time division-long term evolution). Lack of availability of handsets and network equipment for the TD-LTE standard have, so far, hobbled the plans of companies planning to offer services using the technology but that may change. China Telecom, the world’s biggest service provider by number of users, has chosen this standard. Bharti Airtel, which spent a total of ₹ 18,500 crore in the auction, said it had acquired 1,800MHz spectrum for 4G services based on FD-LTE over and above the spectrum it already has in the 2,300MHz band for TD-LTE. The company will pay ₹ 5,425 crore to the government in this fiscal and the rest in 10 annual instalments. Bharti won 900MHz spectrum in Delhi, Mumbai and Kolkata. Vodafone said it had retained 900MHz spectrum in Mumbai, Delhi and Kolkata and also bought 1,800MHz spectrum in 11 other circles. Vodafone will pay ₹ 5,600 crore to the government in this fiscal. “We have opened the door to the next generation of mobile technology, 4G, by acquiring 1,800 spectrum in the places where we expect this market to take off first. Vodafone Mumbai is the only operator in India to have data capabilities on all the commercial spectrum bands: 3G on 900MHz and 2,100MHz and 4G on 1,800MHz," Marten Pieters, managing director of Vodafone India, said in a statement. Bharti and Vodafone needed to buy back spectrum in eight and 10 circles, respectively, through March 2016 in places where they have mostly the more efficient but expensive 900MHz airwaves as their permits are lapsing, beginning November. Idea Celular Ltd will have to renew bandwidth in nine places over the next two years, though none of its licences would expire in 2014. Idea Cellular spent ₹ 10,400 crore to acquire 900MHz spectrum in Delhi for 3G services and 1,800MHz in 11 circles as top up for its voice services as well as to offer 4G services in eight of them. The company will pay ₹ 3,100 crore as upfront payment, it said in a statement. Idea Cellular won 1,800MHz spectrum in nine circles and 5MHz of 900MHz spectrum in Delhi while Aircel won 1,800MHz spectrum in five circles. Uninor added 1,800MHz spectrum in six existing circles (where it won spectrum in 2012) and added Assam for a total of ₹ 844crore. The government has successfully been able to auction all the 46MHz of 900MHz spectrum available in the three metro circles of Delhi, Mumbai and Kolkata for a total of ₹ 23,589 crore, 35% more than the expected minimum price. Similarly, almost 80% of the around 400MHz of 1,800Mhz spectrum was successfully sold for a total of ₹ 37,572 crore. “The auction has provided much needed long-term certainty and clarity around spectrum and other regulatory policies," Gopal Vittal, joint managing director, India, of Bharti Airtel said in a statement. The final amount is 90% of the ₹ 67,719 crore the government got from the auction of 3G spectrum in 2010, the first such sale of airwaves carried out by the government. The 2010 auction lasted 34 days; the sale of broadband wireless access specturm lasted 16 days. In contrast, the November 2012 2G auction lasted two days, and the March auction last year ended in a day and sold only CDMA spectrum in some circles. The government is expected to receive ₹ 18,296 crore in the year to 31 March as the companies are allowed to initially pay an upfront amount and the rest in annual instalments. In this case, 25% of the final bid amount has to be paid upfront by successful bidders in the 900MHz band for airwaves in Mumbai, Delhi and Kolkata, and 33% of the winning bid amount in the 1,800MHz band across 22 circles. Shares of Bharti Airtel fell 1.8% to ₹ 302.6 on BSE on Thursday, while the Idea Cellular stock declined 1.13% to ₹ 131.45. Reliance Communications Ltd shed 0.79% to ₹ 118.95. The exchange’s benchmark Sensex fell 1.25% to 20,193.35 points. This is the third time the government has held an auction for 2G spectrum but the first one to be considered a success after the earlier ones, held in November 2012 and March 2013, were together able to sell only one-third of the available spectrum for around ₹ 10,000 crore, a fourth of the estimated earnings. The funds are expected to help the government narrow the fiscal deficit to 4.8% of gross domestic product, a key target for the ruling Congress party-led government. The bids will help the government surpass the ₹ 40,000 crore target set at the beginning of the fiscal year in the Union budget, as receivables from telecom, including licence fees and spectrum charge, among other payments. Eight telecos participated in the auction including Bharti Airtel, Idea Cellular, Reliance Communication Ltd, Vodafone India, Tata Teleservices Ltd, Telewings Communications services Pvt. Ltd (that runs the Uninor brand of services), Aircel Ltd and Reliance Jio. There is, however, unlikely to be any immediate impact on tariffs. “The overall outcome of the higher input cost should have been increase in tariff, however, due to intense competition, all the increase in cost is unlikely to get passed on to the consumer. 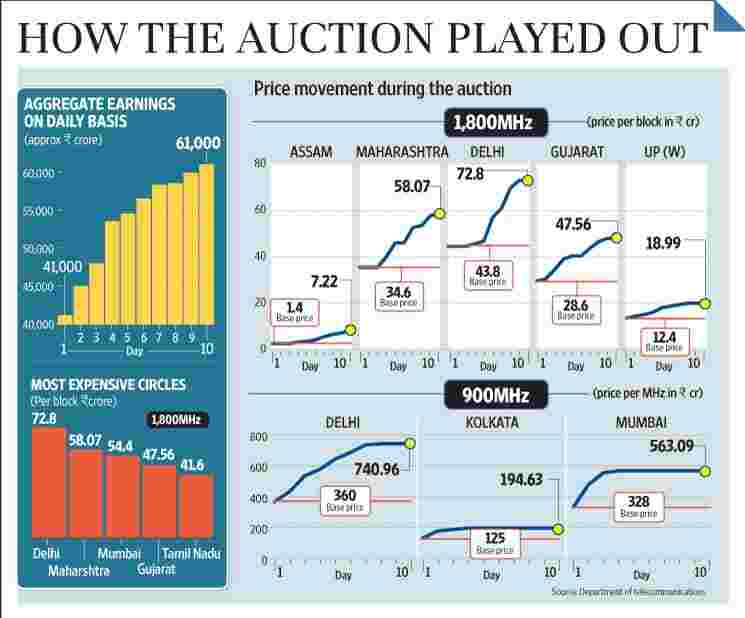 The already highly leveraged balance sheets of the telcos would get more leveraged and operators are also likely to face bottomline pressure," Hemant Joshi, Partner, Deloitte Haskins and Sells, said, a sentiment echoed by communications minister Kapil Sibal after the auctions. The Cellular Operators Association of India (COAI), the key lobby group for the GSM network-based telcos expressed disappointment at the high final prices. “While the industry is relieved at the conclusion of the auctions, there also lies disappointment at the winning price points," a statement from COAI said. “It remains to be seen if the operators will have the financial resources to invest in networks and marketing after bearing the high spectrum costs." The high cost of spectrum was also a worry among operators. “The auction has raised over ₹ 61,000 crore for the government, but much of this will end up as debt on the balance sheets of the mobile operators. Such high industry indebtedness will hurt operators’ ability to invest in the roll out of new technologies and invariably result in higher prices and reduced service levels for consumers," Pieters said.